"Their destiny is in your hands." Keeshond, Samoyed, and Collie dogs! Purebred dog owners can contribute to research that will improve diagnostic testing for hypothyroidism. Don't miss your chance to participate! Healthy dogs are needed now! The AKC Canine Health Foundation, Collie Foundation and OFA have funded a study to determine breed-specific reference intervals for thyroid hormone concentrations in samples from healthy pure-bred dogs. Rebecca Davies, PhD, from the University of Minnesota Veterinary Diagnostic Laboratory is conducting the study and is currently looking for volunteers. Scientists and breeders CAN work together to benefit both dogs and science! Read this very informative article by C.A. Sharp. As fanciers of the Alaskan Malamute, we owe it to these wonderful dogs to keep them healthy. You can help by participating in our research programs. It can be as simple as filling out a survey, or as profound as donating a blood sample from your dog for research. Every little bit helps! Please be patient as we add information about these and other disorders to the site. We welcome suggestions about what to include. but he's not letting it slow him down! Dr. Wayne Potts of the University of Utah needs participants for his study involving autoimmune thyroiditis, diabetes, and hemolytic anemia. Go to this page to find out how you can help. The study is funded in part by the Alaskan Malamute Club of America through CHF Grant 305. NOTE! This is not a Malamute-only study. Please feel free to refer your friends with other breeds to this web site. Alaskan Malamute Club of America will soon be asking its members to complete a questionnaire that will help us to learn more about skin and coat problems in our breed. It is critical that you fill out this survey and return it promptly, whether or not you have any dogs with skin or coat problems. This survey is being done in conjunction with the Virginia-Maryland Regional Veterinary Medical College, to whom we are most grateful. All breed and breed specific health programs and surveys. 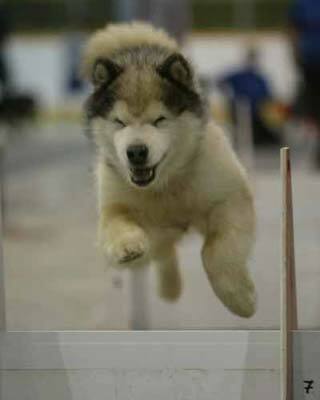 Supporting research projects specific to the health and welfare of Alaskan Malamutes. of basic information on animal care, and the studies funded by this non-profit organization. The single most comprehensive electronic reference for animal care information. This site is provided for information purposes only. It is not intended as a substitute for veterinary care. If your dog has a medical problem, please see your veterinarian.